Jack Wallace (Franklin Lakes, N.J.) scored twice, including the championship-clinching goal with 7:29 to play in regulation, to lead the 2018-19 U.S. National Sled Hockey Team to a 5-4 victory over Canada in the championship game of the 2018 Para Hockey Cup. "We say all the time that we don't want anything handed to us and tonight we had to earn every bit of this championship victory," said David Hoff, head coach of the 2018-19 U.S. National Sled Hockey Team. "What a fun hockey game to be part of and what an exciting victory for this team. It's always fun to win and we couldn't be prouder of all 17 players here tonight." With the win, the U.S. finishes the 2018 Para Hockey Cup with a perfect 5-0-0-0 (W-OTW-OTL-L) record and its fifth-straight title in the event. In the tournament's 12-year history, the U.S. has claimed a tournament-best seven titles (2009, 2012, 2015, 2016 (Jan.), 2016 (Dec.), 2017 and 2018) along with two second-place finishes (2011 (Nov.) and 2013) and three third-place efforts (2007, 2008 and 2011 (Apr.)). Canada opened the scoring 3:45 into the game when Rob Armstrong redirected a pass from Billy Bridges past U.S. goaltender Steve Cash (Overland, Mo.). Trailing for the first time in tournament play, the U.S. took control for the rest of the frame. Just two minutes after Canada’s goal, Declan Farmer (Tampa, Fla.) nearly drew the game level when he stole the puck for a breakaway chance that went wide. A minute later, Noah Grove (Frederick, Md.) sped past a Canadian defender for an opportunity from the right face-off dot that was gloved aside by Canadian goaltender Corbin Watson. Back-to-back Canadian penalties with just under five minutes in the period generated a 5-on-3 U.S. powerplay and a trio of U.S. scoring chances. The first came from Farmer, who pounced on a deflection for a backhanded effort that rang off the crossbar and away from goal. Moments later, a right-handed shot from Brody Roybal (Northlake, Ill.) sailed wide before Wallace saw his shot from the left hashmark blockered away. The game broke open in the middle frame as the two teams combined for a five-goal period. Roybal started the scoring 2:02 into the stanza by sprinting onto a clearing attempt from Wallace for a breakaway goal. Just 2:56 later, Josh Pauls (Green Brook, N.J.) gave the U.S. its first lead of the game when Josh Sweeney (Portland, Ore.) found him in the slot for a shot he tucked into the top right corner. Less than two minutes later, Canada struck twice 11 seconds apart to take a 3-2 lead. Bridges struck first at the 6:49 mark before Liam Hickey tallied for a go-ahead goal. With 34 seconds to play in the frame, Wallace drew the U.S. level by sliding a right-handed shot beneath the sled of Watson. The play started in the right corner with Farmer pushing the puck to the bottom of the right face-off dot for Wallace to net the game-tying goal. The final stanza opened with Kyle Zych (South Hadley, Mass.) putting the U.S. up, 4-3, when he deflected a high-rising shot from Grove. Three minutes later, Sweeney nearly gave the U.S. a two-goal cushion but saw his shot from the right side of the crease turned aside by Watson. Tyler McGregor then lifted a shot from the right face-off dot over Cash to knot the score, 4-4, with nine minutes to play in regulation. Just 1:31 later, Wallace tallied the game-winning goal on another U.S. powerplay. The championship-clinching goal came when Sweeney dished the puck to Kevin McKee (Chicago, Ill.) who found Wallace in the slot for his second goal of the game. Cash finished with seven saves to secure the championship win for Team USA. NOTES: Jack Wallace (Franklin Lakes, N.J.) was named the U.S. Player of the Game ... 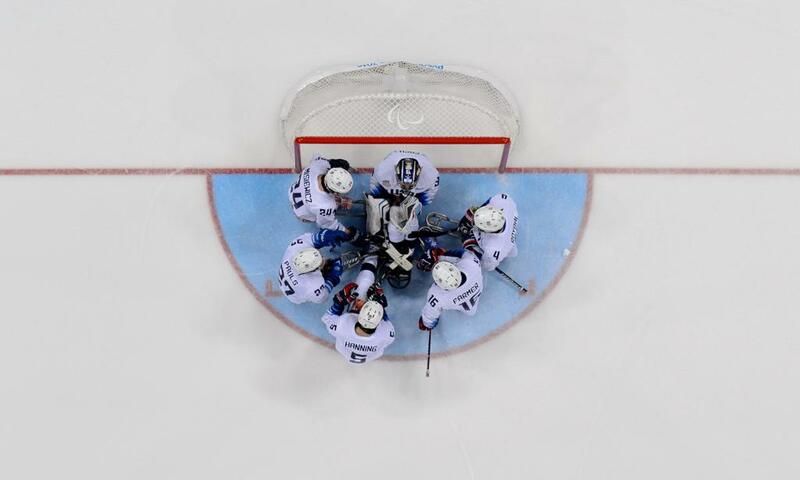 The U.S. outshot Canada, 23-10, went 1-for-3 on the powerplay and finished 2-for-3 on the penalty kill ... For complete statistics, click here … Deloitte, Labatt USA and Toyota are proud sponsors of the U.S. National Sled Hockey Team … For complete coverage of the U.S. National Sled Hockey Team, click here.